And so today I’d like to direct your attention to the most popular, as it seems, service, that does exactly that. It’s called FBDown.net and it’s quite popular, hitting the top 5k most used websites on earth, according to Alexa. So let’s take a look at FBDown.net and see how to use it. Do not worry, this site is different from our usual youtube downloader suspects like YoutubeInMp4, Offliberty or KeepVid. The principal difference is that is has google adsense advertising, which policies protect users from showing ads in popups, tricking you into clicking them, and many other rules that protect user and their website experience. In this tutorial example I will use one of my own videos from facebook showing how to use Savefrom to download youtube videos. Since downloading facebook video is a new thing for us, i will list here full URL link for the video that I am about to download using FBDown.net. Usually i do not post full links, but those always are youtube links, and everyone knows how they look. With facebook it’s different, URL Link is not always visible. The easiest way to get it is to click on the video and see if it opens its own new window. In that case simply click on the browser URL box and copy CTRL+C that video URL. Or you can right-click on the video, no matter where it is playing, and choose “SHOW VIDEO URL” option. It’ll open a small box with the video address, which you can copy to clipboard by pressing CTRL+C or right-click + copy. Below is a screenshot of how this action looks on my computer. It is also the first step in this tutorial, because getting facebook video URL can sometimes be tricky. The red arrows indicate where to find the Facebook Video URL. As mentioned before, it can be copied from the browser URL address box, if you are on the video’s dedicated page. Or you can right click on the video and select “show video URL” option in the menu that pops up. For mobile users, simply tap and hold on the video, then select Copy Video URL from the box. Or tap and hold on the browser address bar, then copy via the menu that opens up..
Now let’s proceed to FBDown.net, open it in your browser and in the only single white box on the page enter the video URL you just copied from Facebook. You can either click in the box and press CTRL+V to insert the URL from clipboard. Or you can tap and hold on browser’s address bar, and select PASTE from the menu that opens (if you’re doing this on an android smartphone or an iphone). Always remember, video downloading websites present opportunity to download video from anywhere on any platform, be that Windows, IOS or Linux, Blackberry or Mac, anywhere…. As long as you have a browser and can open a website, you are all set to download videos or convert video to mp3. Red arrows indicate the box where to insert the facebook video URL, and the buttons to click when you’re done. After that you’ll see the screen as depicted below, with the options to download video. fbdown.net concentrates on facebook videos. but what if you want to download videos and photos from Instagram, one of the most successful projects owned by facebook (mind you, owned, not developed)? In such case you should use this Instagram Video Downloader. It’s new, it’s well cared for, it is guaranteed to be functional, try it out. Now you will see something like the screenshot below, where you can notice 2 links to download video from facebook. On the left we have LD – low definition video, which is good for mobile viewers usually.. On the right – HD – high definition (as facebook perceives it at 2000kbps max with 720p resolution). 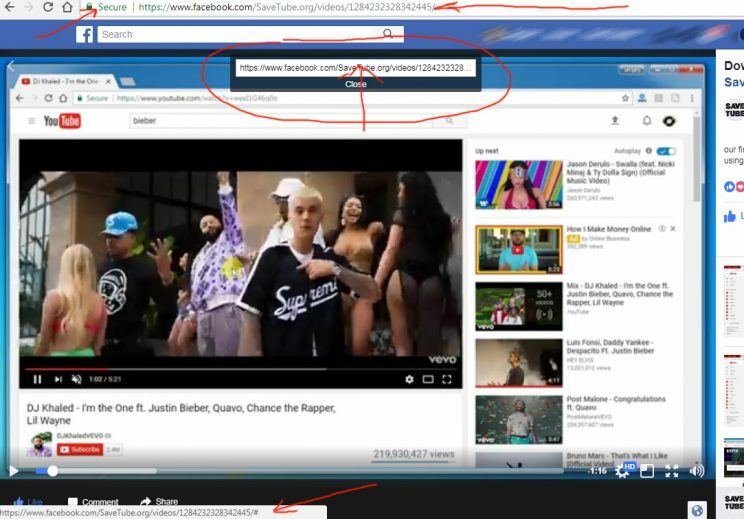 For easy download, savetube recommends right click on the link and Save File As option. Or tap-and-hold for mobile users, with eventual Save File As option being selected. Haha, I wrote the conclusion first, then looked and figured it is basically the review of FBDown.net, so this time i am combining review and conclusion as one piece. In two words, this site works good and does what it promises with good UX. 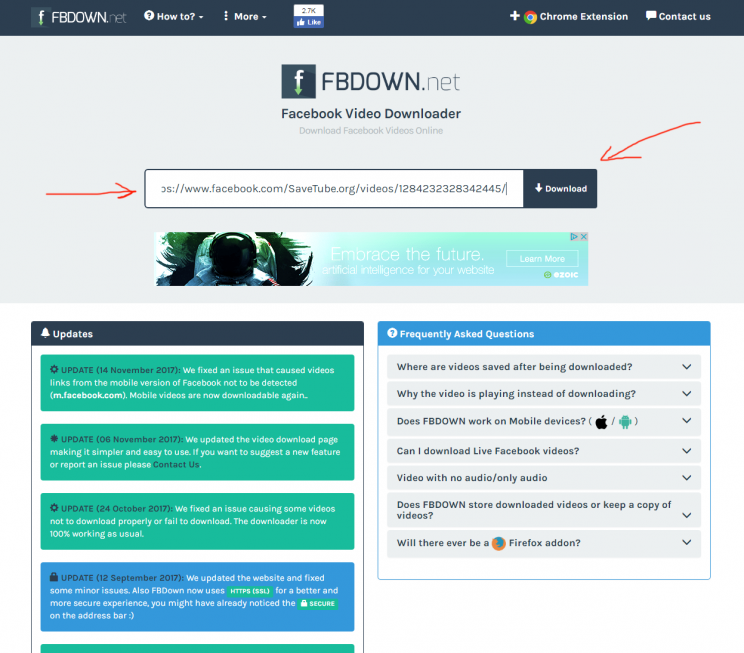 It is very easy to use FBDown.net to download Facebook video. But that is where it ends, i mean, its functionality. This website is no good for anything but video download from facebook. You cannot convert video to mp3, as for example TheYouMp3 or YTmp3.cc can do for youtube. In any case, this website is useful for it does what it promises. And thanks to facebook not being worried yet about video downloaded from their platform (mostly because only small percentage of it has copyrighted content, and after being on facebook loses any HD video or sound quality, so is not editable, really), this site has google adsense advertising, which is very unintrusive and is very user friendly. finally video downloader site with normal ads, no popups, very good experience. Where does it place the download file? ?